A widower struggles to connect with his sons. Trier and Vogt have fashioned a very human set of humans. I'd gladly watch more relative non-adventures of the Reed family, but I'll settle for whomever else Trier decides to study under his finely tuned microscope. For a long time, American cinema was dominated by European writers and directors. It wasn't until the 'movie brat' generation emerged from the rubble of the studio system in the late 1960s that American filmmakers really took over their industry. Transplanted foreigners may have plied their trade on a daily basis for decades, but since the '70s, the masters of world cinema have rarely dabbled in English language storytelling. America holds a curious fascination for the rest of us, and this is often reflected in the films foreigners make when given a chance to work in that vast country - with mixed results; for every Paris, Texas, there's a My Blueberry Nights - so often set in the dusty SouthWest or on the great highways that keep America alive, like the turquoise veins of a giant's arm. 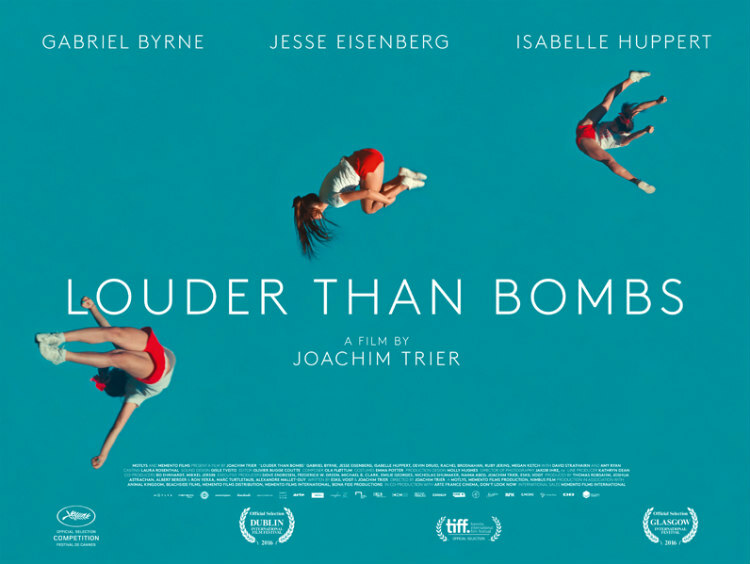 Afforded the chance to work in the US thanks to his acclaimed feature Oslo, August 31st, Norway's Joachim Trier shows little interest in exploring Americana; Louder Than Bombs could be set anywhere in the western world. It takes place for the most part indoors, and what little we see of its Upstate New York locale might as well be a suburb of Trier's Oslo. There's little to suggest the script (co-written with Blind director Eskil Vogt) may not have originally been set on Trier's home Scandinavian turf. Shunning the opportunity to explore the American psyche, Trier instead turns his lens on the universal themes of grief and loss of connection. 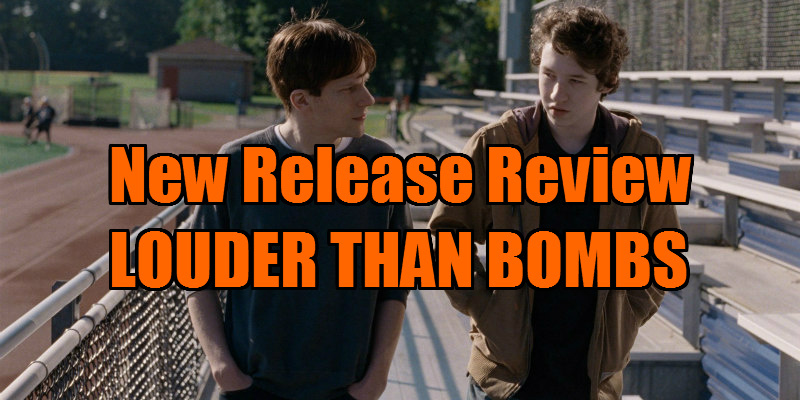 Three years after the death of his photographer wife Isabelle (Isabelle Huppert) in a car crash that may have been a particularly drastic suicide, former actor turned teacher Gene Reed (Gabriel Byrne) is struggling to connect with his 15-year-old son Conrad (Devin Druid), a loner who writes lengthy existential tomes when he's not spending hours playing an online fantasy game. In a heartbreaking scene, Gene logs onto the game and spends weeks looking for his son in the online world, hoping to form a virtual bond in lieu of a real life connection. When he finally bumps into Conrad's online Avatar, his son strikes him down without ever realising it's his father. Gene's older son, Jonah (Jesse Eisenberg, thankfully free of any Lex Luthor histrionics or Zuckerberg tics), is suffering from quite the opposite problem. Having just become a father, he finds himself smothered by his wife and newly arrived child, and retreats to his father's Upstate home under the guise of helping Gene sort through Isabelle's remaining photos, which are sought after by a Manhattan gallery. With the three men under the one roof, the hallways and staircases of Gene's house become battlegrounds of passive aggression. Byrne is one of his generation's most under-rated actors, and lately he's come to symbolise a curious brand of male, middle-aged and middle-class melancholy. His Gene is deeply sympathetic; we feel the weight on his heart every time Conrad deals him another blow. What makes it all the more frustrating is how Trier shows us that Conrad actually loves his father - he bonds with Jonah over a YouTube clip from Gene's acting days (actually a clip of Byrne from the 1987 Shelley Long vehicle Hello Again, one of several references to '80s cinema to be found here, from Risky Business to Dario Argento's Opera) - but like any teenage boy, can't be seen to display such affection. Druid, previously seen as a teenage Louis CK in the TV show Louis, is a revelation here; initially we want to strangle him for his treatment of his father, but as the film progresses we feel guilty for judging him so. With the exception of Isabelle, a character cut from the same clichéd war photographer cloth as the one played by Juliette Binoche in 2013's A Thousand Times Good Night, Trier and Vogt have fashioned a very human set of humans. We genuinely care about the welfare of Gene and his boys, and the film's sweet but subtle resolution offers one of those little rewards we spend our lives hoping to collect. I'd gladly watch more relative non-adventures of the Reed family, but I'll settle for whomever else Trier decides to study under his finely tuned microscope.